For those with wide and thick feet we highly recommend you to go for NEXT SIZE UP because the shoes size (Euro/AU/UK/US) only takes care of the foot length. 1.PayPal ( Recommended ) - If you want to get your item(s) quicker, this is your choice. 2.MasterCard/Visa (It may take up to 5 business days to clear payment). We will delivery your order(s) through Australia Post or Fastway Couriers. Once your payment is cleared we will dispatch your order(s) from Melbourne warehouse in next business day. We will authorize the courier drivers to leave your parcel in safe areas of your premises if no body is home unless you contact us to disagree with "Authorize to leave". *For heavy items please do not use PO BOX or parcel lockers to receive items. I strongly encourage you to use a physical street address for the purpose of safe delivery. 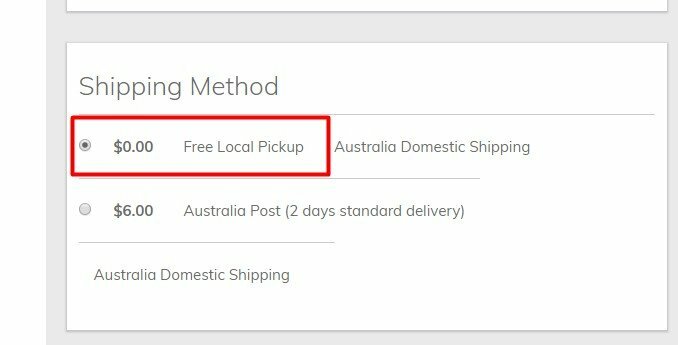 You will be given the option of "Local pickup" on checkout page to avoid postage if your address is in Victoria and your total order amount is over $40.